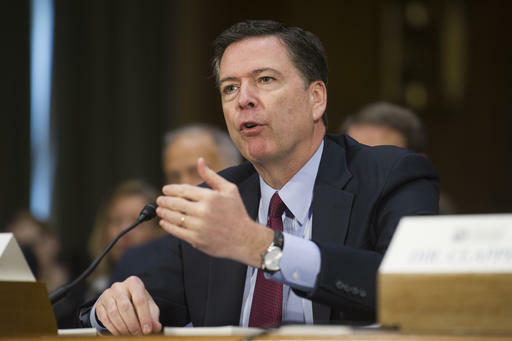 WASHINGTON (CN) – President Donald Trump has asked James Comey to stay on as the director of the FBI, against the backdrop of an ongoing inquiry by the Justice Department’s inspector general into his handling of the Hillary Clinton email investigation. But Comey, who is a Republican and has lead the FBI since 2013, has been an object of scorn and controversy since he reignited concerns over Clinton’s email practices while she was secretary of state only days before the presidential election. In a letter delivered to Congress the Friday before the election, Comey announced his agency had found more emails related to its investigation into Clinton’s use of a private email server — months after his office said no criminal charges against Clinton were warranted. Though Comey later told Congress the emails revealed nothing to change the agency’s initial decision not to recommend charges against Clinton, some Democrats have blamed the explosion of negative headlines for Clinton’s loss in November. Justice Department Inspector General Michael Horowitz has launched an investigation into the department and FBI’s actions in the months leading up to the 2016 election, including whether Comey followed department policies. .
President Donald Trump criticized the FBI during the campaign for its decision not to recommend charges against Clinton, but at a gathering of law enforcement officials over the weekend in Washington, Trump greeted Comey warmly and revealed to attendees that the FBI director would be staying on. The decision comes at a delicate time in Trump’s relationship with federal law enforcement. The New York Times also reported last week that multiple agencies, including the FBI, are looking into alleged connections between members of Trump’s team and Russian officials during the election. Trump has long been critical of the contention that Russia attempted to swing the election in his favor, something multiple intelligence agencies now agree occurred.